The first ever band we interviewed for this website was Ekkoes at the end of 2016, so when they got back in touch to say they were releasing their first new single in over two years and their second album, we couldn’t resist a second interview, and not just so they can become the first band we have interviewed twice. Me: For those who have not come across Ekkoes before tell us more about yourselves? Dave Fawbert: We’re a three-piece synth-pop act from London and Limerick with one foot in the electronic 80s and one foot in the present day. We released our debut record, ‘Elekktricity’ in 2016 and followed it up by joining The Human League on their UK & European tour (which was amazing). After having spent the last couple of years writing, we’re just about to unleash our second album, ‘Kinetik’. Me: What can we expect from your new album Kinetik? Dave: Big choruses and big production! We’re all a bit bored of the whole minimal production style that has been dominating the charts for the last few years so we’ve decided to go in the opposite direction: Maximalism. Me: Your first single from the new album is You Got The Light. How would you describe the single in 10 words? Me: Last time we interviewed you was at the end of 2016 whilst you were supporting The Human League on tour, what have you been up to since? Dave: Locked away in the studio, pretty much! After finishing the Human League tour – which was one of the highlights of our career to date – we decided to take a bit of time away from playing live and focus on our second album. We did however manage to get out and play a few shows with Erasure on their world tour (one of our all-time favourite groups) and supported xPropaganda on their recent London dates so it’s been a fun couple of years. Me: You have chosen to have one of the two album launches in Sheffield. Why have you chosen the steel city for the launch and what are you looking forward to most about holding the event in Sheffield? Jon: It’s just a truly great musical city. I went to university there so spent four years of life getting to know the city and its people and it’s one of those places that has always held a bit of special place in my heart. Plus we sold out of albums when we last played here! Me: You have remixed songs for the likes of Kate Bush, George Michael and Lana Del Rey, but if you could remix any song or have any artist remix your songs off the new album who would you choose and why? Dave: That’s a tricky question… back in the day Ekkoes did a series of absolutely amazing remixes for people like Ian Brown and Queens of the Stone Age… But one of our favourite artists of recent times is St Lucia, who never fails to create utterly joyous music, so perhaps them attacking You Got The Light would be pretty epic. Me: We’ve noticed the band loves a good re-spelling, from echoes to kinetic, but what other words would you love to change the spelling of? Me: And finally, what’s coming up for you after the launch of Kinetik? Dave: We’re really looking forward to getting out there and doing a few of our own headline shows as we haven’t done any for such a long while. After that we’ve got a few other things in the pipeline that we’ll be announcing closer to the time! 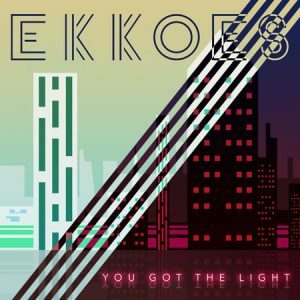 Ekkoes first new single in two years You Got The Light is released on 27 July. To listen and buy the single visit http://smarturl.it/YGTL. Their new album Kinetik is released on 7 September. For further information on Ekkoes visit http://ekkoes.com/, like them on Facebook at http://facebook.com/ekkoes, follow them on Twitter at https://twitter.com/ekkoesmusic and subscribe on YouTube at www.youtube.com/c/EKKOESUK. To read our first ever interview with Ekkoes click here.